Dean Walsh with uncle Billy (right). DEAN WALSH IS awaiting confirmation on whether he will be able to have his uncle and former Ireland head coach Billy back in his corner for his National Elite Championship final on Friday. Reigning Irish senior light-welterweight champion Walsh defends his title against ex-European champion Ray Moylette this weekend in a rematch of their 2015 final meeting, which took place last January. The 2016 edition of the championships are being held early to prepare for Olympic qualifiers next year and Walsh and Moylette won their respective semi-finals last weekend to book a 64kg rematch. Walsh took part in what was quite possibly the fight of the championships so far when he nicked a split-decision win over James Cleary of Galway’s Olympic club last weekend. The 21-year-old Wexford native had his father, Dónal, in his corner for the victory, but he hopes his uncle, Billy, might join them for the decider against Moylette. The former Ireland coach is now head of USA Boxing’s women’s team after leaving his post with the Irish Amateur Boxing Association (IABA) in acrimonious circumstances last October, and it is uncertain whether he will be able to work his nephew’s corner on Friday. “Billy’s over in Sheffield [with USA Boxing] the weekend of the finals, so he’s thinking of making an appearance for the finals,” explained Dean. “I’d say he could [be in the corner], but I don’t know what the terms are since he’s the USA coach. I don’t know if he’s going to be there or not,” he added. 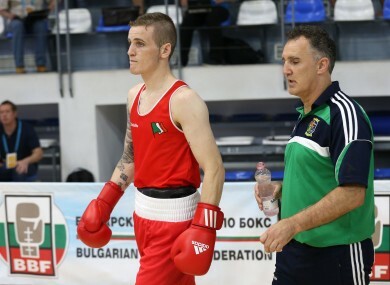 While the 21-year-old boxer has expressed his eagerness to prove that he can succeed despite his uncle’s departure as Ireland coach, this is the first national championships without him in his corner. Walsh enjoyed a close battle against the aggressive Cleary last weekend, but the Wolfe Tone Villas native said: “His [Cleary’s] crowd thought he won it, I thought I won it and that I landed the cleaner shots. “It was a brilliant scrap and I’d thank James for maybe one of the fights of the seniors,” he added. Meanwhile, the IABA are bolstering their coaching plans in the build-up to the Rio Olympics next year. The inaugural IABA High Performance Coaching Seminar was led by interim head coach Zaur Antia at the National Stadium on Sunday, with 180 club coaches in attendance. Katie Taylor and Darren O’Neill participated in the seminar, which is part of the IABA’s efforts to help bring club coaches closer to High Performance standards. Email “Dean Walsh wants uncle Billy back in his corner for Friday's national final”. Feedback on “Dean Walsh wants uncle Billy back in his corner for Friday's national final”.